Buried here are Gen. “Stonewall” Jackson, 296 Confederate veterans, two Virginia governors and Margaret Junkin Preston. 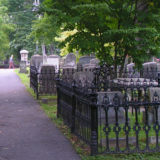 View the cemetery walking tour map, or pick one up a the Lexington Visitor Center. View the children's scavenger hunt map.